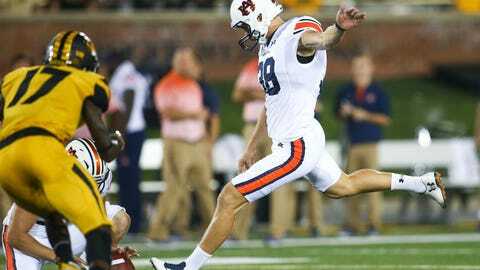 EAGAN, Minn. — Daniel Carlson’s career-best field goal at Auburn was 56 yards. His confidence range indoors reaches 65. During pre-draft training in the high altitude of his home state Colorado, he said, even a 75-yard kick was makeable. “The whole objective right now at this point is to create the most competitive 90-man roster that you can, regardless of position,” general manager Rick Spielman said last weekend after making Carlson the 167th overall selection. When the Vikings drafted Walsh in the sixth round in 2012, they released reliable incumbent Ryan Longwell the day after the rookie minicamp was complete. The same scenario played out in 2013 with punter Jeff Locke, a fifth-round pick, and his outspoken predecessor, Chris Kluwe. For now, the Vikings have said they’ll keep the competition open. Still, a fifth-rounder is a high price for a specialist. The 17 college free agents signed earlier this week included cornerback Holton Hill from Texas and linebacker Hercules Mata’afa of Washington State, considered two of the top undrafted players. Among the unsigned prospects aiming to follow the lead of Marcus Sherels in 2010 and Adam Thielen in 2013, as tryout players who earned a contract after the rookie minicamp and eventually made the team, are safety Mackenro Alexander of Iowa State, the twin brother of Vikings cornerback Mackensie Alexander; Northern Illinois wide receiver Chad Beebe, the son of former Buffalo Bills standout Don Beebe; and quarterback Matt Linehan from Idaho, the son of former Vikings and current Dallas Cowboys offensive coordinator Scott Linehan.